Supporters and friends who have toured the center also give it a thumbs-up. Our retaining wall uses boulders instead of concrete, creating a more natural look at a lower cost. We certainly appreciate the kind words. But we are most grateful that we now have a home – one that is both environmentally and economically responsible – from which we can advance our mission. This project could not have been possible without a generous, unsolicited gift from a donor who wishes to remain anonymous. 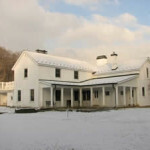 The gift covered a majority of the $6.5 million cost of the project, which is part of a multi-phase land-protection initiative that has permanently preserved about 135 acres in Moreland Hills. The anonymous gift was the largest in the history of the organization. “We are exceedingly grateful for this astonishing gift which reminds us daily of the saying, ‘Of those to whom much is given, much is expected,’” says Rich Cochran, president and CEO of the Land Conservancy. 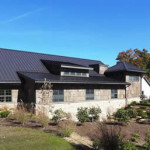 The center, located at 3850 Chagrin River Road, includes a restored 5,000-square-foot historic century home and newly constructed, environmentally-responsible 11,000-square-foot addition that now houses the Land Conservancy’s main office. Trails running through property link the center to the adjacent village-owned Forest Ridge Preserve and the Cleveland Metroparks Polo Field. The Buckeye Trail is across the street from our headquarters. It was a 2007 visit to the former Land Conservancy offices, located on the second floor of a Chester Township strip mall, that inspired the donor and her husband to make the offer. The project did not exist until they came forward with their vision and offer. Their lead gift inspired other large monetary donations plus key materials donations from Willoughby Supply Company and Fairmount Minerals. Cochran praises Moreland Hills Mayor Susan Renda and the village for embracing the project. The building is environmentally and economically responsible. In order to reduce storm water runoff and surges that diminish aquatic habitats and lower water quality, the Land Conservancy incorporated water management features known as bioswales into its landscape design. 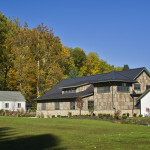 Our energy-efficient construction – a geothermal heating and cooling system, a foundation that used Insulated Concrete Forms and an office constructed with Structural Insulated Panels – resulted in a building requiring 60 percent less HVAC equipment than a conventionally built structure of the same size. Poplar bark siding is durable and never needs to be treated. We followed Mother Nature’s lead in using poplar bark siding on the office addition and installing a beautiful rockery instead of a concrete retaining wall – a move that also saved us $60,000. We also used local materials and talent on the project. In addition, we plan to add interpretive displays and help restore a cold-water creek that runs through the property. 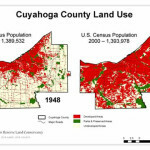 The Land Conservancy is grateful to have a new home and even more thankful that it gives us the opportunity to accelerate the pace of our work in northern Ohio. Our surroundings inspire us. Please stop by and say hello. To arrange for a tour of the building, please contact us.